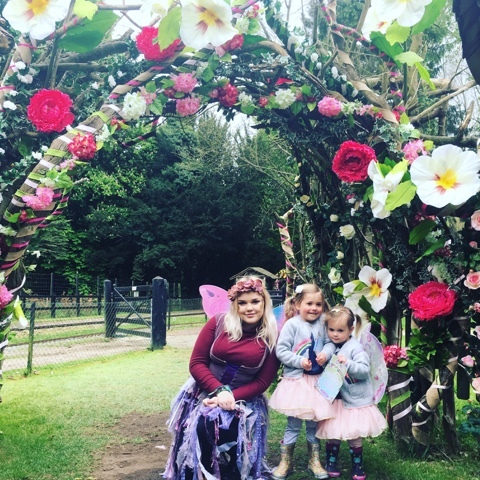 If you are looking for a magical day out with your littles then look no further... Last week I took the girls to Audley End Miniature Railway to visit their Enchanted Fairy and Elf Walk and it was safe to say they absolutely loved it. 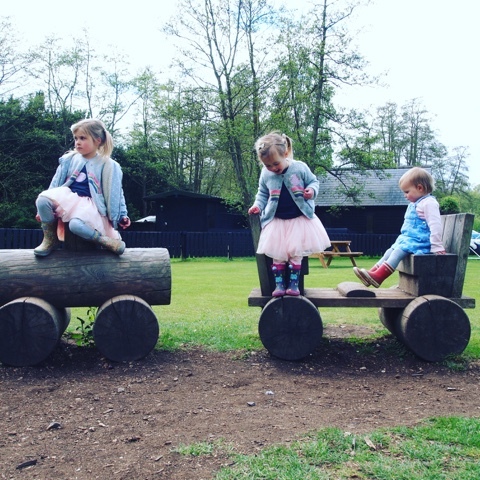 From the minute you arrive at Audley End there is a sense of magic in the air, it's a space for children to be children, play and imagine. 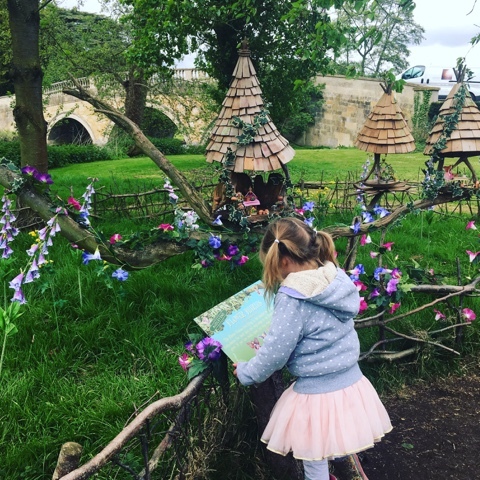 The girls were so excited when we arrived when they saw the miniature steam train full of happy passengers and even more so at the prospect of spotting fairies! 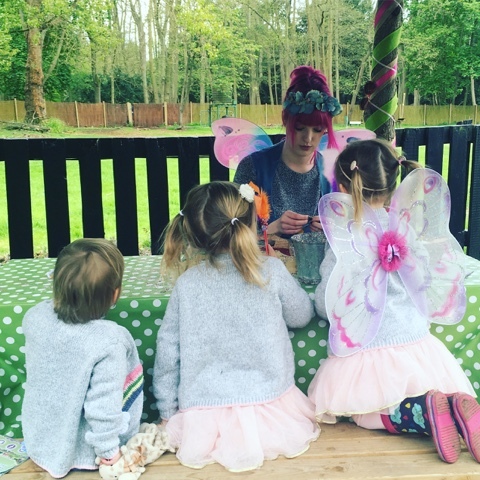 We started our day with the Fairy and Elf Walk and were greeted by two lovely fairies at the entrance who transformed the girls pencils into fairy wands with feathers and magic glittery fairy dust. The floral archway looked so beautiful and inviting and we couldn't wait to go through it and explore. Ready to find some fairies! 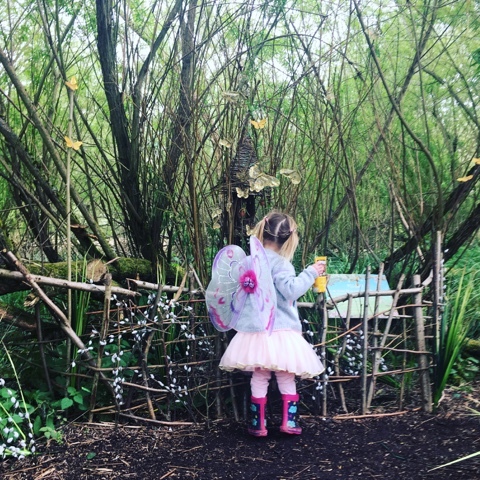 The children are given a checklist to complete along the trail as they spot the fairies that live in the woods. The thing I loved about this is that both Miss Tibs (3) and Miss Boo (5) could complete this as they just had to tick the boxes next to the pictures of the fairy as they saw them. Armed with their magic, fairy decorated pencils and a wish they were so keen to follow the trail. The attention to detail along the fairy and elf walk is absolutely incredible and really sets little (and big) imaginations racing. 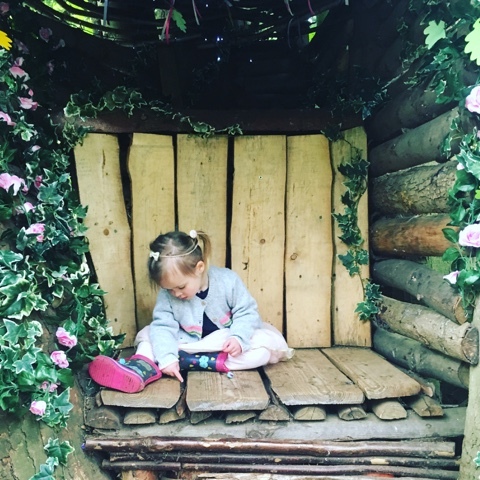 Tiny wooden houses in trees, complete with tiny furniture, butterflies, flowers and gems are waiting to be discovered, each one different to suit the fairy that occupies it. The girls loved peering into the houses and seeing what and who was inside. 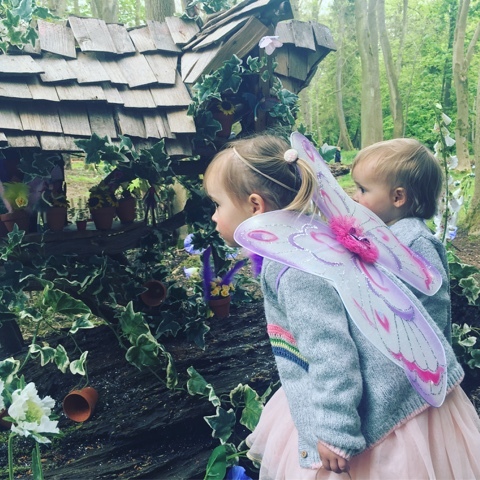 Each dwelling has a little sign next to it that tells you which fairy lives there and a little bit about them which the girls listened to intently before ticking them off in their booklets. Everything is at just the right height for little eyes and completely fascinated the girls holding their concentration for a good 45 minutes. Their little faces were just adorable to watch as they made their way along the trail, each corner bringing with it something new to explore and find - they literally couldn't believe their eyes and thought it was completely and utterly magical. 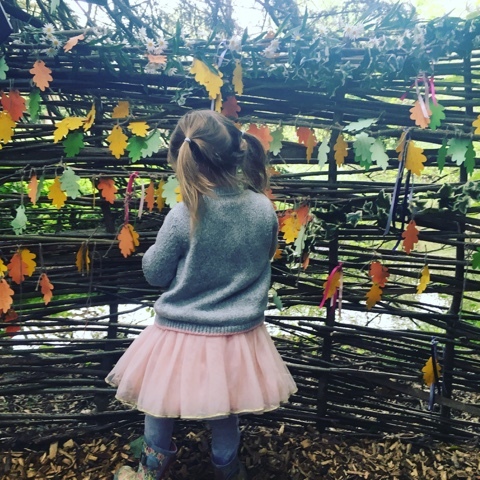 One of my favourite parts of the trail was the wishing wall at the enchanted tree where we hung little paper leaves with wishes the girls had written on them for the fairies to grant. 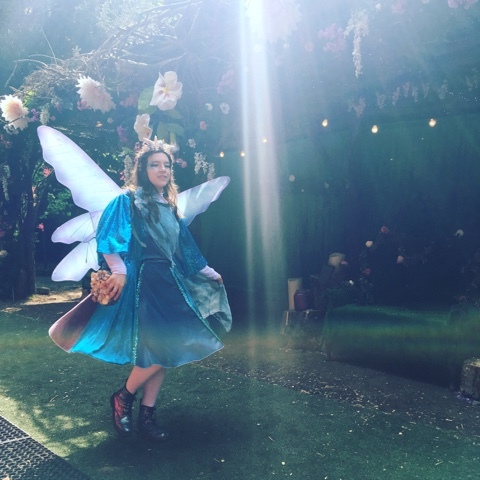 They both wished that they could be fairies and were so excited about the prospect of their wishes being granted as the sat in the fairy chair hidden within the trees next to it. Miss Tibs right at home on a fairy throne. The trail was so magical the only way the girls would leave it was with the promise of a ride on the miniature steam train. We had pre booked our slot in advance but you can also book a slot which allows you to ride anytime within an hour giving you a bit more flexibility. 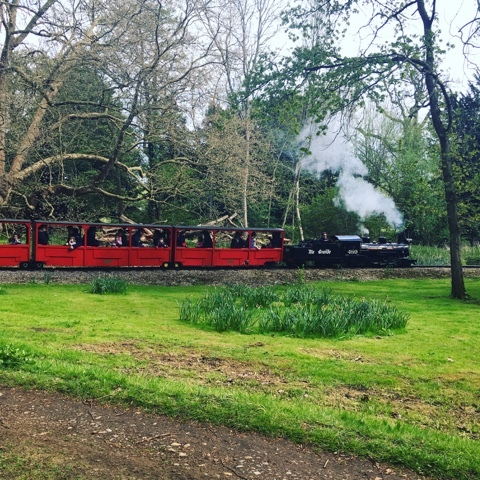 The train ride lasts a good 15 minutes and maintains the magical atmosphere of the fairy walk with music at the station and really welcoming and enthusiastic staff ensuring a special trip. The train takes you through the woods with lots to spot along the way including lots of teddy bears in little houses and tunnels and bridges - the girls loved it! 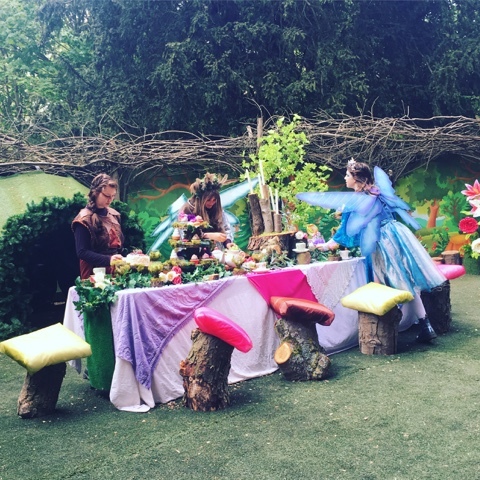 As it was opening weekend there was an extra special element to the train journey which involved a stop at a tea party with 'real' fairies who danced and played before finally presenting each child on board the train with a tiny bottle of fairy dust. 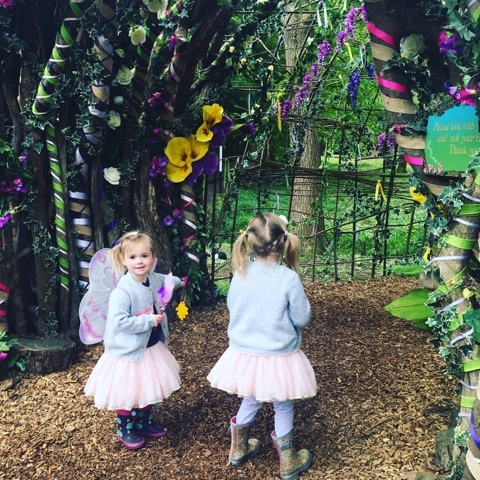 This really was such a lovely surprise for the girls and they clutched their fairy dust so tightly for the remainder of the day and could not believe their eyes. We explored the rest of the site after our train ride. 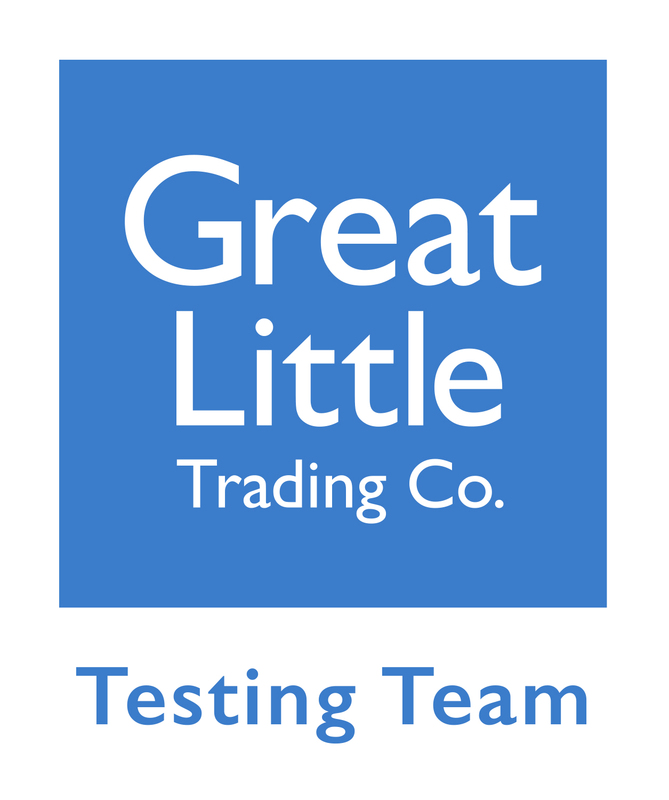 There is a big open park space in the middle with a wooden play area consisting of little houses, a wooden train and some swings, along with a bouncy castle and fairground swing which are a small additional cost but can be used for as long as you like. There is plenty of space to picnic along with a refreshment booth serving drinks and cakes and there is also the signal box cafe serving homemade, locally sourced food. 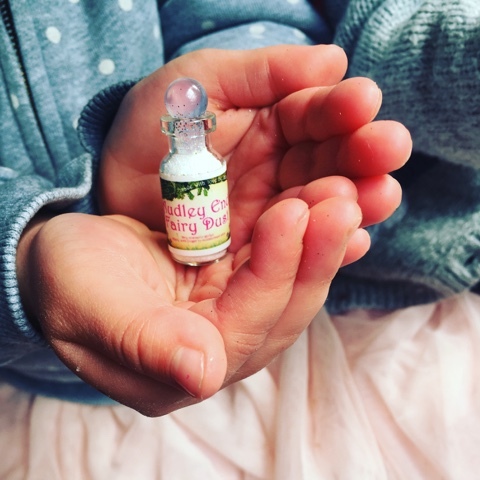 To finish our day we visited the craft tent where the girls made glittery blue mermaid potions in tiny bottles to take home with them, a lovely touch which was also included with our tickets. We really did have such a magical day, the only downside was having to leave and we are already planning a return visit. There are lots of special events on throughout the year which look amazing - particularly the Christmas experience. I'd recommend booking tickets online in advance, particularly on the special event days to ensure you don't miss out, other than food and drinks everything is included in your ticket price making it excellent value for money. 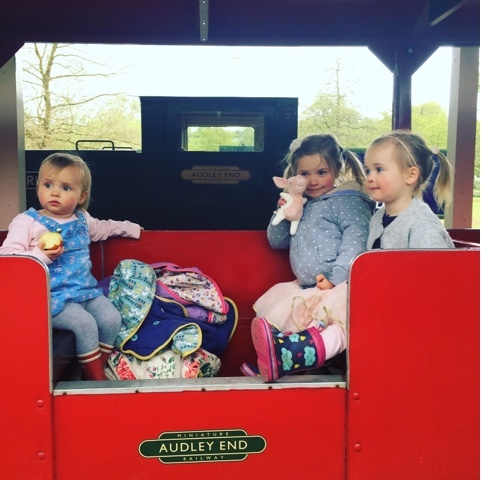 Audley End is located just south of Cambridge not far from the M11 making it easily accessible yet you leave it feeling like you have entered another world, a world which the little ladies fully immersed themselves in. I put them to bed at the end of the day with their fairy dust under their pillows and a real sparkle in their eyes asking me when we could go again, before they dreamt of fairies all night long. *This is a collaborative post. 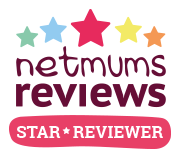 We were kindly gifted entry in exchange for a review.